Dramatically perched on an Andes mountain ridge some 8,000 feet above sea level in Peru, Machu Picchu is a visual wonder and a technical masterpiece. “It is breathtaking,” said Brenda Bradley, an associate professor of anthropology at the George Washington University. The Inca built the site’s 15th-century ruins without mortar, fitting the blocks of stone so tightly together that you still cannot fit a piece of paper between them. The design included steeped, agricultural terraces to boost planting space and protect against flooding. But despite its distinction as one of the most iconic and important archeological sites in the world, the origins of Machu Picchu remain a mystery. The Inca left no record of why they built the site or how they used it before it was abandoned in the early 16th century. Now, Dr. Bradley and a team of researchers will be the first to analyze the genomes of the skeletal remains from more than 170 individuals buried at the site. The team’s other members include Lars Fehren-Schmitz from the University of California, Santa Cruz and Yale University’s Richard Burger and Lucy Salazar. By sequencing the skeletons’ ancient DNA, the researchers hope to better understand the functional role of Machu Picchu and its residents, as well as patterns of diversity, migration and labor diaspora in the Inca Empire—the largest in pre-Columbian America. Yale explorer Hiram Bingham launched a study of the “lost city of the Incas” in the summer of 1911. His work included excavating Machu Picchu and bringing human bones and other objects, like ceramics and jewelry, back with him to the United States. The artifacts remained at the Yale Peabody Museum in New Haven until 2012, when, after years of negotiations, the bones and relics were sent back to Peru. The Peru-Yale University International Center for the Study of Machu Picchu and Inca Culture houses the bones and relics. The museum, in Cusco about 45 miles from Machu Picchu, is open to the public and includes more than 360 items from Dr. Bingham’s original excavation. Before returning the skeletons to their home country, Dr. Bradley—who was a Yale faculty member at the time—and her colleagues scrambled to collect DNA samples from the ancient bones. Next, with a recent National Science Foundation grant, the researchers will use cutting-edge methods to sequence nuclear, mitochondrial and Y-chromosome DNA from the samples. Dr. Fehren-Schmitz will conduct the initial analysis, and Dr. Bradley will attempt to replicate the results in her lab. 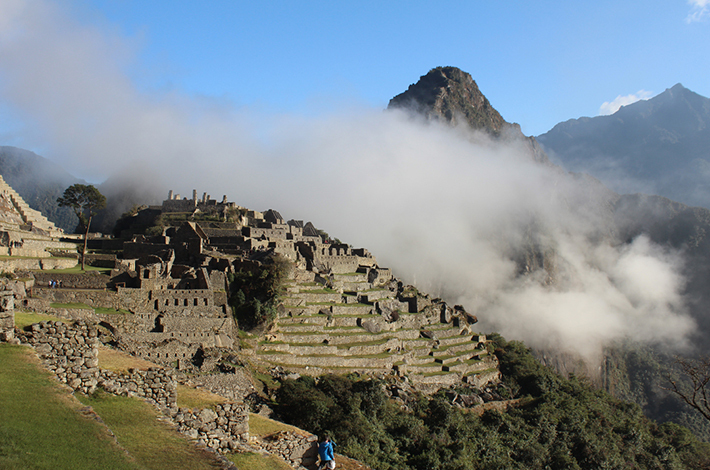 The researchers will then compare the results of the genetic analysis with previous data from Machu Picchu in order to provide a more comprehensive understanding of the site. The prevailing hypothesis among researchers is that Machu Picchu was a so-called “royal retreat”—akin to what Camp David is for the White House—where Inca Emperor Pachacuti would have visited and held diplomatic meetings, Dr. Bradley explained. The archeology indicates that people who resided there were likely crafts specialists brought in from locations throughout the empire to work at the site. The genetic analysis will test this hypothesis by showing the relationships among the ancient people, whether they are from the same ancestral lines and locations, said Dr. Fehren-Schmitz, who has analyzed the genomes of many different populations throughout South America. This information also will help to put Machu Picchu in the context of the larger Inca Empire. The researchers said the wealth of genomic data they plan to collect also would provide an interesting look at how colonialism affected people living in the Andes. Since the skeletons from Machu Picchu represent a pre-Spanish conquest population, they can compare those genetics to post-colonial DNA.